Although every month in the Hindu calendar is considered auspicious, the Shravan month (also known as Sawan or Savan) has a special significance in the Hindu religion. Shravan is the fifth month of the Hindu year. It begins in late July from the first day of the full moon and ends in the third week in the month of August, the day of the next full moon. In fact, the Shravan is the holiest month of the year for the Hindus. According to Hindu scriptures, each day in the month of Shravan is considered highly auspicious. It is believed that Lord Shiva showers special grace during the holy month of Shravan. Lord Shiva blesses his devotees with many boons. 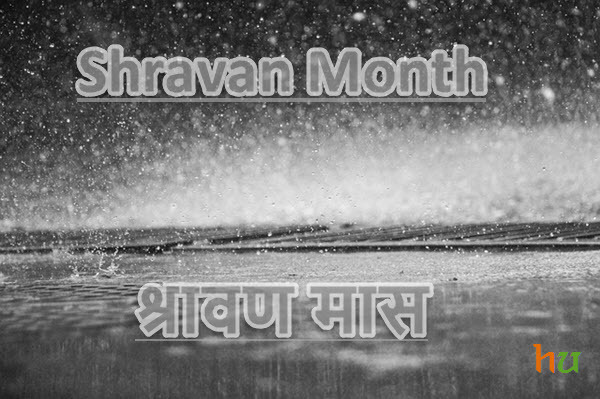 Shravan itself is very important for the entire Indian sub-continent as it marks the onset of South-West Monsoons. Here is a post that describes the Shravan Month Importance & Date. The Shravan month derives its name from the “Shravan” Nakshatra which rules the skies during this month. In fact, the Shravan month is very much synonymous with the auspiciousness of the festivals. Moreover, Lord Shiva rules the entire Shravan month. The Shiva Lingams are bathed with holy water and milk throughout the day into the night. The Shiva Lingams are offered Bael leaves, flowers, holy water, and milk which is known as an offering of Falam-Toyama, and Pushpam-Patram. It is done on each Shravan Somvar. Devotees keep fast throughout the day. They lit up Akhand Diya that burns throughout the day into the night. The Hindu mythology relates a very important legend regarding the Shravan month. It has been described in the Shiva Purana. The episode is of Samudra Manthan. In fact, the Samudra Manthan is a very important episode as per the Puranas. Asuras and Devas performed it. During the great churning, as much as 14 different rubies emerged from the ocean. From these 14 different rubies, thirteen rubies were divided among the Devas and the Asuras. The 14th ruby was Halahal. It was the deadliest poison which had the power to destroy the whole universe including every living being. The Halahal was untouched by the Devas and Asuras. Lord Shiva volunteered and consumed the whole Halahal and stored it in his throat. The Halahal was so poisonous that it turned His throat blue. After that Lord Shiva came to be known as “Neelakantha.” The effect of the poison was enormous. All the Devas offered water from the holy River Ganges to Lord Shiva. It was done to reduce the effects of the poison. These events took place in the holy month of Shravan. It is therefore considered very auspicious to offer Ganges water to Lord Shiva in this month. Devotees wear Rudraksha and use it for Mantra Japa. In fact, it is considered very auspicious to wear Rudraksha beads during the holy month of Shravan. (Mondays in Shravan Month are considered very auspicious for offering special Puja to Lord Shiva. It is called as Sawan Somvar). Bhibhuti is offered to Lord Shiva. The Bhibhuti is smeared on the forehead as well. Beal Leaves are offered to Lord Shiva. Panchamrit made out of a mixture of milk, curd, ghee, honey, and Jaggery is offered to Shiva Linga. Chanting of Maha Mrityunjaya Mantra is done. Devotees keep fast on Shravan Somvar especially young women who want good husbands. As per the Hindu mythology, Sati, the daughter of Daksha, had sacrificed her life and was reborn as Parvati in the home of King of Himalayas. She wanted to marry Lord Shiva. That’s why she took to immense penance during the month of Shravan. Lord Shiva got pleased with the immense devotion of Parvati. He fulfilled her wish and married Parvati. Lord Shiva has a particular liking for the Shravan month as he got united with his wife during this very period. Shravan month 2019 began on 17th July and the last day is 15th August. During this holy month, people take to worshiping Lord Shiva. One needs to adhere to religious principles and practices during Shravan Month if one wants to gain the blessings of Lord Shiva. Moon is the ruling lord of Monday. Moon is representative of the Mind. In fact, when you see the picture of Lord Shiva, you can easily spot the crescent moon placed on Lord Shiva’s head. In fact, Lord Shiva disciplines the mind of a spiritual devotee. Lord Shiva is the ruler of the Moon. So, Hindus worship Lord Shiva on Mondays. If one worships Shiva Linga on Shravan Monday, it is easy to get the blessings of Lord Shiva. Men, women, and unmarried girls keep fast on Shravan Mondays to get the blessings of Lord Shiva quickly. There is also a popular custom among the Hindu devotees where they perform 16 (Solah) Somvar Fast beginning from the first Monday in the Month of Shravan. They continue the fast until they keep it for Solah Somvar. This process is known as Solah Somvar Vrata. This Vrata is performed for success, marriage, and prosperity. It is advisable that one should wake up before sunrise. He/She should take a bath and go to the nearest Shiva Temple. You have to face the East direction while worshiping Lord Shiva. Now, take some water in your right hand and make a wish. You need to concentrate on Lord Shiva. Then pour the water on Shiva Lingam. Take Panchamrit and pour it over Shiva Lingam. Keep chanting the Mantra Om Namah Shivay. Now, again pour water over the Shiva Lingam. Offer Akshat and Bael Patra to the Shiva Lingam. Light incense sticks. Offer sweets to the Lord and pray for forgiveness. Doing “Maha Mrityunjaya” Jaap is also beneficial if you are facing any health-related issues. One can also perform Maha Mrityunjaya Havan on every Sawan Somvar. Perform his Abhishekam to cleanse your soul. Bathing the Shiva Lingam with scented water, you get a son. Offering Him Naivedya, you live long for many years. Lighting a Diya before his idol, you get knowledge. If we offer Pan to Lord Shiva, we get ample food. Bathing his idol with milk, you get peace of mind. If one performs his Abhishek with curd, he/she gets good vehicle and cattle wealth. Performing his Abhishekam with ghee or sugar cane water, we are blessed with wealth and happiness. Bathing him with Darha water, all our problems get solved. If we bathe with Ganga Jal, you attain Moksha. Offering Bhaang to Lord Shiva helps us to gain victory, and our desired wish is fulfilled. Sindur or Kumkum should not be offered to the Shiva Linga. Rather use Sandalwood paste to worship Him. Tulsi is prohibited for worshiping Lord Shiva. Do not offer water in a Shankha to Lord Shiva’s idol or Shiva Lingam. Shankha is the symbol of the demon Shankhachood that was killed by Lord Shiva. Many Hindu festivals are celebrated during the holy month of Shravan. Here, we list out the main festivals that are celebrated during this time. Krishna Janmashtami is one of the major Hindu Festivals that is celebrated during the month of Shravan. Janmashtami is the birth anniversary of Lord Shri Krishna. It is celebrated on the 8th day after the full moon in the month of Shravan. Krishna Janmashtami is celebrated across the globe with great pomp and glamour. Raksha Bandhan or Rakhi Poornima is another very important festival that is celebrated during the month of Shravan. The festival celebrates the bond of love between brothers and sisters. It is celebrated on Shravan (Sawan/Savan) Poornima. In some states of India such as Maharashtra, and Gujarat Sawan Poornima is celebrated as Narali Poornima. People of this region offer a coconut to the seas as a mark of respect to the God of Seas, Lord Varuna. Narali Poornima also marks the beginning of the fishing season. Fishermen start fishing in the sea after performing this ceremony. The fifth day after Amavasya, Nag Panchami is celebrated on Shravan Month. People worship Snake God, Naga. Basava Panchami which is a celebration of the Lingayat Dharma is celebrated in Karnataka on the fifth day after Amavasya. Shravana Poornima is also celebrated as Prabhu Balaram birth Ceremony. Prabhu Balaram was the elder brother of Lord Krishna. It is celebrated in Odisha. All the domesticated Cows and Bullocks are worshiped on this day. Devotees engage themselves in various devotional activities during the month of Shravan. They undertake activities such as worship, Sadhanas, meditation, or bhajans at their home or in a Shiva Temple. One should visit a Shiva temple during the month of Shravan. Each day of the Shravan month has a special spiritual significance. Monday: It is dedicated to the worshiping of Lord Shiva. Tuesday: It is dedicated to the worshiping of Mata Gauri. It brings good health and peace in their family. Wednesday: It is dedicated to “Vithala” an incarnation of Lord Vishnu or Shri Krishna. Thursdays: It is dedicated to the worship of Guru. Friday: Dedicated to the worship of Goddess Lakshmi or Tulsi. Saturday: It is dedicated to the worship of Shani Deva. It is known as Shravan Saturdays or Sampat Sanivara. Prayers are offered for obtaining wealth. Sundays: It is dedicated to the worship of the Sun God. It is practiced since the Vedic times. Worshiping God is considered very auspicious during the Shravan month. The Shravan month is highly auspicious as per the Vedas. Devotees can engage in activities that relate to the worship of Lord Shiva. “Abhishek” is a method used to worship Lord Shiva for cleansing all the misgivings and sins. It is popularly known as “Rudra Abhishekam” or Shiva Abhishek. It involves the offering of Panchamrit. Rudra Abhishek consists of a mix of milk, honey, sugar, ghee, Ganga Jal, Bael Patra, Dhatura, and other sacred items. Rudra Abhishek and Homa are undertaken to purify your mind and body. It offers peace, fulfills your desires, and enlightens your soul. The following mantras can be chanted in the month of Shravan. It can be done with a Rudraksha rosary or silently in mind. It can be done for 108 times or multiples of it in the morning or evening time. Fasting during the month of Shravan has a special significance. It has been mentioned in the Shiva Purana. Observing fast in the Shravan Month blesses devotees with the grace of Lord Shiva. Shravan Somvar Vrata (Fasting) is very popular during the month of Shravan. Austere Fast: A person undertaking the fast does not eat anything for the entire day except for drinking water. The fast is broken after sunset, and regular food is consumed without onion and garlic. Partial Fast: Persons undertaking a partial fast can consume fruits and some permitted foods such as Sabudana and nuts in the day. They can eat one time meal in the night. The fast is usually broken after sunset; however, in some cases, it can continue till the next day. Devotees offer prayers to Lord Shiva and then consume normal food. Some devotees undertake a Maun Vrata (Silence) for the entire day and remember Lord Shiva in their mind. Fasting during the month of Shravan and particularly on Mondays offers lots of benefits to the devotees. Devotees are blessed with spiritual bliss. Shravan Fasting helps to improve physical and mental health. It increases willpower and memory. Women who do Shravan Somvar Vrata get their perfect husband. Fasting helps to remove obstacles by expelling negative energies. Shravan Month is considered highly auspicious by the Hindus. The Shravan Mont date for the states of Maharashtra, Andra Pradesh, Goa, Gujarat, Karnataka, and Tamil Nadu. In 2019, the Shravan Month will begin from 2nd August (Friday) and will end on 30th August (Friday). However, in the states such as Uttar Pradesh, Madhya Pradesh, Rajasthan, Punjab, Himachal Pradesh, and Bihar it will be celebrated from 17th July (Wednesday) to 15th August (Thursday). Shravan is the fifth month of the solar year. According to Vedic Astrology, Shravan Maas begins when Sun enters the Zodiac Sign of Leo. As per the lunar calendar, Shravan begins on the New Moon Day. On Full Moon Day, the divine firmament comes under the celestial sovereignty of the Shravan Nakshatra. Hence it is known as Shravan. Shravan Month is highly auspicious for the worship of Lord Shiva. Why Shravan Month 2019 is so special? It will have five (4) Shravan Somvar. It is believed that whoever keeps the Shravan Somvar Vrata throughout the Shravan Month is said to get special blessings from Lord Shiva and Mata Parvati. All their desires get fulfilled by the grace of Lord Shiva and Mata Parvati.